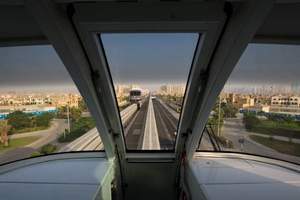 Nakheel says the Palm Monorail will continue to run despite the Dubai World-owned property developer cancelling the operations and maintenance contract with the Singaporean rail company SMRT. The transit system, which cost US$380 million (Dh1.39 billion) to build, opened on Palm Jumeirah in May last year and runs up the “trunk” of the palm tree-shaped island. Nakheel cancelled the deal with SMRT as part of the “ongoing restructuring of its business”, SMRT told the Singapore stock exchange, adding that “Nakheel has exercised its contractual right of early termination”. The contract will be cancelled from August 5. “Palm Monorail will continue to operate as usual,” a spokeswoman for Nakheel said. But the developer declined to say whether a new operator would be hired. Nakheel is in the process of restructuring $10.5bn owed to banks, contractors and service providers, and is reviewing its short and long-term projects. The company presented its financial creditors with repayment proposals at a meeting on Wednesday, while trade creditors have started to receive 40 per cent of what is owed to them. At a cost of Dh25 for a round trip, the monorail has mainly served as a tourist attraction since it opened eight months after Dubai was hit by the global financial crisis. Passengers climb aboard at Gateway Towers at the entrance of the Palm for the 10-minute ride to the Atlantis, The Palm on the crest of the island. The 5.5km track has two stations in between – Trump Station and Palm Mall, previously called Village Centre – but the train does not stop at them. Trump International Tower Hotel and the former Village Centre projects were put on hold at the end of 2008, giving passengers little reason to alight there. Meanwhile, Gateway Towers, a three-tower project that was scheduled to be ready before the train made its maiden journey, is also at a standstill. The system is the first of its kind in the Middle East. When the monorail was launched, there were plans to link it up with Dubai Metro, which opened last September. The system was also going to connect with Al Sufouh tram on Jumeirah Beach Road, although work on this project has been slow. About 90 people worked on Palm Monorail for SMRT. A senior member of staff, who asked not to be named, said it was unclear what would happen to the employees because it had been only a week since the company was told the contract would be cancelled. Previous articleDubai Metro: World's Longest Automated Driverless Train Lunched!